SINGAPORE - Along Toa Payoh Lorong 6, an orange dragon roars on against the tide of time. 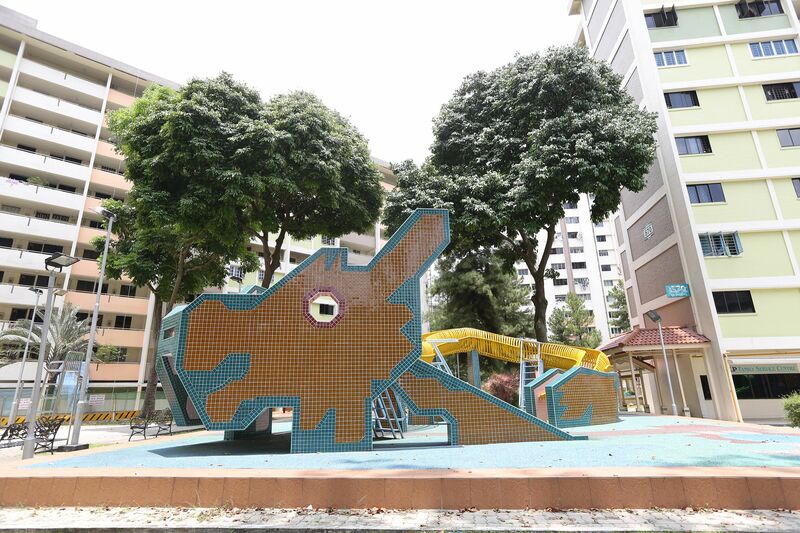 The iconic dragon-shaped playground, which was completed in 1979, will be preserved despite plans to revamp the mature Toa Payoh estate. A heritage marker will be installed at its site, revealed the Housing Board in plans unveiled at the HDB Hub atrium by Defence Minister and Bishan-Toa Payoh GRC MP Ng Eng Hen on Saturday (April 22). The brainchild of then-HDB designer Khor Ean Ghee, it is distinguished from modern playgrounds by its strong geometric lines and use of concrete, terrazzo and mosaic tiles, features abandoned owing to safety concerns in the mid-1990s. 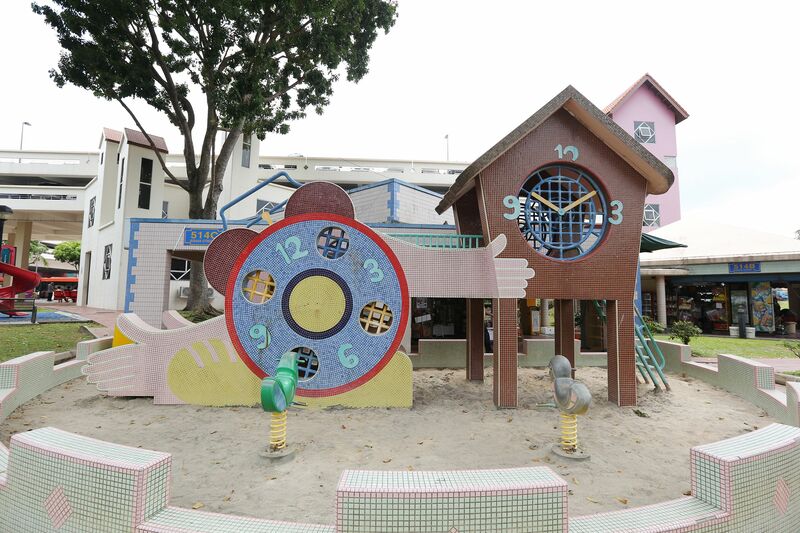 Located next to Bishan Interchange along Bishan Street 13, clocks are this playground's dominant motif. It forms a likely unintended irony when framed against the constant threat of removal for the sake of redevelopment. Dating back to around 1988, the small playground features a house on stilts with a clock face on its facade. Metal ladders and a bridge allow the young and young-at-heart to clamber and traverse behind the clock face, before sliding down a terrazzo slide hidden by another clock face. Quaint rocking horses atop metal springs can also be found at this playground, which is built on a sandpit that has not been replaced by the more modern rubber matting. Slated for redevelopment by the end of this year, the estate is one of the oldest in Singapore. A pair of doves watch over the now-vacated blocks, awaiting their likely imminent destruction. A spiral slide made of terrazzo emerges from between the cuddling doves and a metal bridge links the structure to a pyramid with a sliding pole, stepladders and tyre swings. A key place for community bonding, the playground has seen better days, but remains a key landmark of the estate. Found in Cheng San estate, this dragon has a similar configuration to its more famous counterpart, but rubber matting has replaced what used to be a sandpit. Built around 1978, it has seen less wear and tear than its famous twin in Toa Payoh Lorong 6. A sinuous metal skeleton forms a twisting ladder from the dragon's "tail" at ground level to its head, where mosaic-clad slides and more conventional stepladders may be found. Defying all conventional definitions of a playground, two dinosaurs stand guard near a clutch of eggs in front of Block 57 on Kim Keat Avenue in Toa Payoh. The adventurous can straddle the slippery back of the dinosaurs, the larger of which stands at about 3m tall, for a unique vantage point of the surrounding area. A stegosaurus-shaped slide accompanies the dinosaurs. 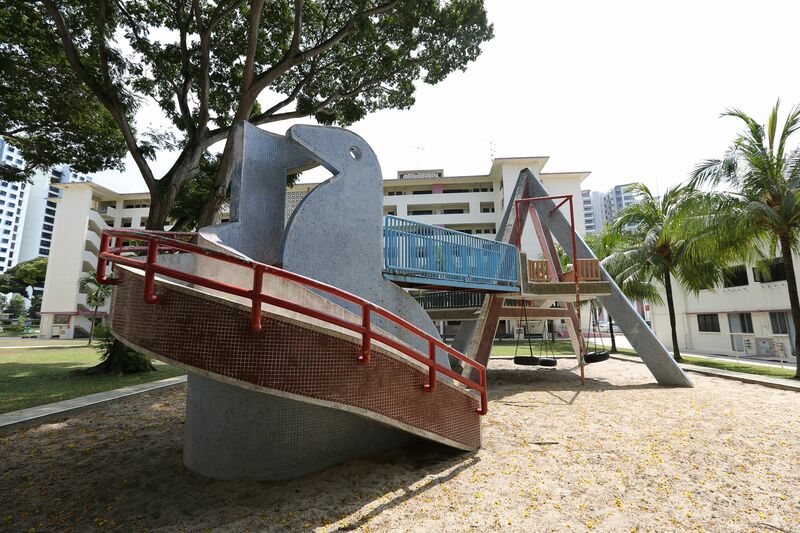 Located near Elias Mall in Pasir Ris, this sampan-shaped playground was completed around 1994. It was one of Mr Khor's final designs. Split into two halves atop a sandpit, one half contains a tyre ladder for children to clamber over, while the other is built slightly higher to accommodate a wide terrazzo slide with ladders at the bow of the sampan. 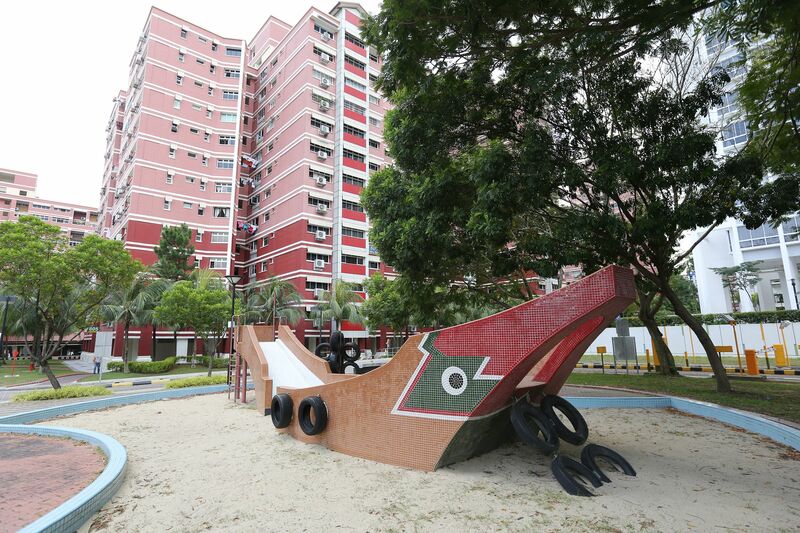 Even the colour scheme of the playground reflects that of a sampan using green, red, brown, black and white tiles, right down to the painted eyes commonly seen on such boats.